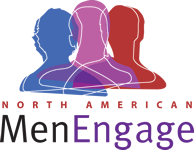 The North America MenEngage Network (NAMEN) is a US/Canada regional network of organizations and individuals working with men and boys to achieve gender equality, end violence, and promote health for men, women and children in North America. NAMEN is not a formally registered organization, but rather a network of members with a steering committee drawn from the general membership responsible for decision-making, communications, and the management of collective activities. NAMEN is the North American regional member of the Global MenEngage Alliance and has a seat on the Global Executive and Steering Committees. MenEngage is a global alliance of NGOs and UN agencies that seeks to engage boys and men to achieve gender equality. At the international level, members include more than 400 NGOs from Sub-Saharan Africa, Latin America and the Caribbean, North America, Asia and Europe. The Alliance came together in 2004 with the general goal of working in partnership to promote the engagement of men and boys in achieving gender equality, promoting health and reducing violence at the global level, including questioning the structural barriers to achieving gender equality. NAMEN is a membership organization. Please consider joining!